Are you ready to see what we are giving away this week? Designed by Julie Herman of Jaybird Quilts, and designed to go with her Mini pattern series! Ruler is 3.5" long and almost 3" wide. You can find a variety of Jaybird Quilt Patterns and notions right here. What color dominates your fabric stash? Giveaway will close: March 2, 2014. This giveaway is open to international readers. Winner will be chosen at random. The winner of the Barcelona Layer Cake is P Bybee. She has been notified by email. PS: I am stocking up on all shades of turquoise and lighter blues for a king size quilt. So I have quite a bit of blue going on right now! I have red and more red. Oh my heck! These are so cute! My stash has been pink but when Aqua became trendy, my stash started being dominated by aqua, so blue might be giving pink a run for her money. :). Kwilter100 at yahoo dot com. I love all colors but for some reason my stash has more blues than anything else! Green, especially lime green, and aqua is a close second. Thanks! Shades of golden/brown/orange. Thanks for the giveaway! Green dominates followed closely by grey for some reason. Then red, aqua and navy My stash has very very little of orange, pink and yellow. I need more white too! It's close between blue and green, but blue wins out. Thanks for the chance to win this clever little ruler. I have the larger ones. They are great. I have more red fabrics than any other color - thanks for the chance to win. 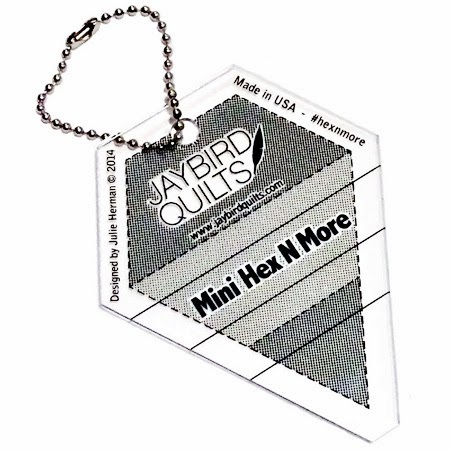 Love this cute little hex n more ruler! hmm, I've been on a gray kick lately and much of my stash has gray in it. Gray with orange, gray with blue, gray with green :) Have a great week! I probably have more blues than any other color. Lately many of them lean toward aqua rather than true blue. Red is my largest color in my stash. Blue is a close second. My stash is really a mix.... I guess to choose one, I'd go with aquas. Thanks for the giveaway! I guess it would be blue..but I have a lot of earthy tones too. Greens and I still dont have just the right shade for a quilt I am making. I have lots of aqua. Thank you for a great giveaway. My stash is old so I have a lot of earth tones. I need low volume and bright fabrics. Red seems to be the predominate color lately! Thanks. Blues and teals dominate my stash! Thanks for the chance to win. I seem to have more blues but red is a really close second. Green! Are there other colours??? That's a hard question! I try to keep a bit of every color on hand. Could I answer fall colors? Ok, I'll say orange! Too much tan... need to add more color! I'd have to say blue! Pinks and purples right now! Oofta, open my doors and the shelves behind them indicates no favored color! I just have an exhibit of a beautiful rainbow...add blacks, and no browns to that rainbow! Red! Thanks for the chance to win! I'm trying to flesh out the rainbow to find more balance, but hands down, it's still blue taking up the most shelf space! Definitely red! But purples are a close second. HELLO, that color is RED ! Nearly half my fabrics have blue as the dominant or at least a strong presence. I have to consciously chose not to use blue. Thanks. Blues, I have a massive amount of blues. Right now blue, since I have bolts of it for my quilting business. RED! I kind of went overboard during christmas as I had NO red, now I have so much I don't know what to do with it. The funny thing is, it's not even my fav. color! Greens are definitely taking over!! Greens, with blue a close second. Looks like I've really got lots of red in my stash, with a healthy dose of blues, too. Blue is trying to dominate lime green. Purple with lime green and orange running a close second. Red. Thanks for the chance. My current quilt sucked up about four yards of blues for the top and another three yards of wide backing fabric. I would say I have a bunch of blue, but I think it would be easier to tell you what color I don't have. I love grab bags and remnants and all those little leftovers sold by the pound. This means I have loads of different things and no one thing has a chance to take over. I went looking for the Mini Hex N More ruler at a local quilt shop. They thought it was a novelty. I tend to always have lots of blue, thanks for the giveaway! I would have to say that blue fabrics dominate my stash! Reds, reds, reds -- and purples! Thanks for the giveaway. I just resorted my fabric and I have more green in my fabric stash than any other color. But I don't like green that much now. I'm drawn to blues and greens, so I have a lot of that. And I love this little ruler . . . especially since it's made in the USA!! Yay! Purple! Thanks for the giveaway. Earthy colors. I love browns and greens and creams. Even if I try to add other colors to my stash, I always find myself drawn back to those beautiful earth tones. Definitely the blues and aquas too! I'm a red person, but for some reason Blues pops out of my stash. Maybe blue is a nice, soothing color for coziness. I'm a blue girl too. All shades of blue, from aqua to navy then it's all brights of the rainbow. I thought blue but in reality it is red. Green and browns are the marjority of my fabrics . Thanks for the chance . I love green and any shade of green. I'm in the middle of sorting out my stash and the surprise answer is green! I have three little girls so you'd think it would be pink, but it's actually blue! Teal and bright pink or green....Lots of bright colors. Lately it has been blue! I would have to say blue. My mother's favorite, dominates my stash. Gold highlights dominate my stash - I can't resist a sparkly fabric! I'm new to quilting and just started building a stash. I can already tell I'm in love with neutrals. Black white and gray have overcome my drawers and I can't help buy buy more! Blue, blue, and more blue. I'm collecting pink fabrics for a pink and white Celtic Knot quilt I'm planning to begin soon. I'm a turquoise and yellow person at this time, I started redoing a bed room and it seems to be spreading. I browsed your blog and shop. Loved the Morning Mist and Hannah's Garden collections. I gotta come back. I'm following you. And thanks for the give away. Blue is my favorite color and is definitely dominant in my stash! Thanks for the chance to win! Right now blues.I`m doing Dear Jane in blue fabrics and buy mostly blue fabrics.Thanks for the chance! Definitely blue. Thank you for the giveaway! Well, I actually had to look at the shelf - and turns out it's red! Thank you!